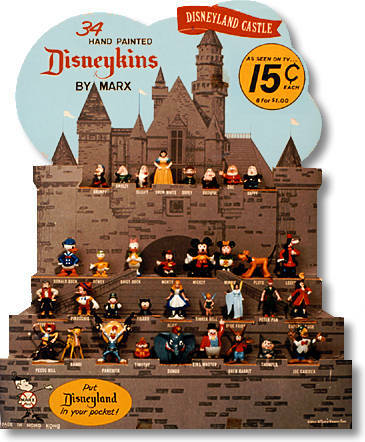 Shown above is the original 1961 Disneykin Castle Store Display, which was called a "Product Demonstrator." For reason unknown, Marx revised the display slightly in 1962, with a second version which has the bottom two rows reversed and a darker blue sky color. Click on picture to return to main First Series page. Disneykins.com averages over 4,000 unique users a month. In 2009 we had over 50,000 unique users from countries around the world! If you have visited this site and found the content both informative and entertaining, please make a donation now. We really appreciate it!